When it comes time to hang traps you need to think about several things before you even head out. If you haven’t read my post on Looking for Spots start there. Once you have chosen your general location you need to decide if you are going to hang the box or set it on something. I have read accounts of people having good luck setting their traps on barrels, decks and rooftops. I’ve caught two swarms by that method, both on accident when I had traps setting outside awaiting deployment. I will be dealing with hanging since that is what I have the most experience with. 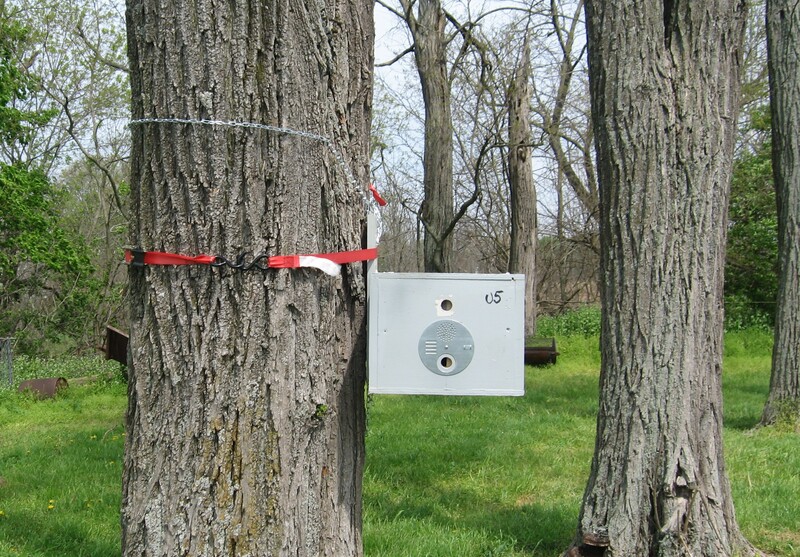 A lot of information abounds about swarm traps needing to be 10-15 feet off the ground. I know from experience that swarms can be caught without this height requirement. I do NOT use a ladder and cannot recommend it to anyone else. The value of $100 worth of bees makes them worth catching, but not worth the risk of falling off a ladder. First and foremost before you even start plan ahead and make sure that your intended location is either somewhere you know no one will mess your trap or you are fairly certain it cannot be readily seen. cheap light duty ratchet strap. (not pictured). A couple scrap pieces of wood of various thicknesses. Prior to modification 1 inch S-hooks don’t have much of a HOOK to them. Post Modification: Note how the ends are turned in slightly making a better hook. First off 1 inch S-Hooks are not very useful until they are modified a little. I use a small pair of needle nose vise-grips for this, but any type of pliers will work. 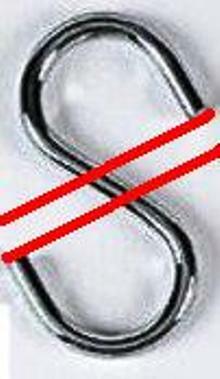 Place the hook in the pliers and bend the ends in just slightly towards the “body” of the S. Note the difference in the pictures. If I have not explained this effectively enough e-mail me and I will try to clear things up. S-hooks and LGO in an old peanut butter jar. 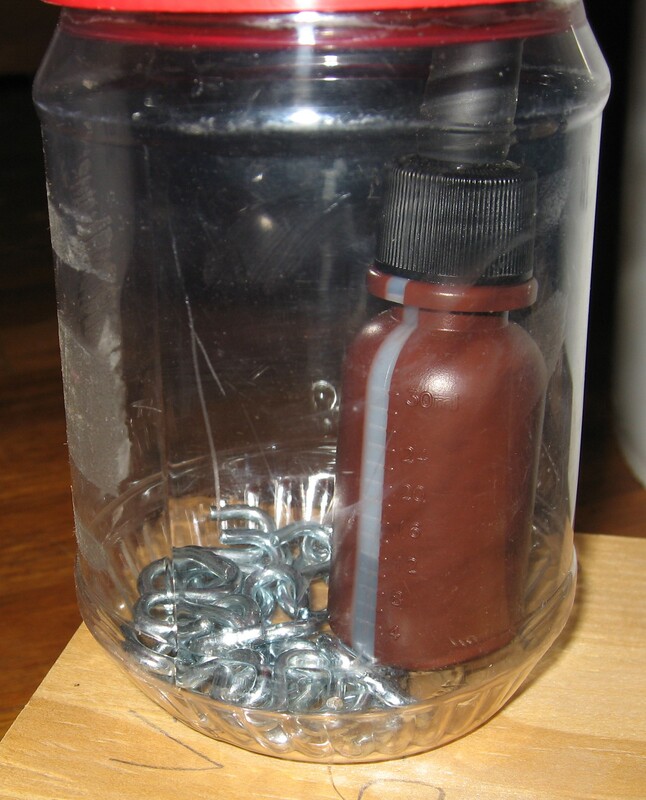 Place your S-hooks and the Lemongrass Oil in the plastic jar so that you don’t lose the hooks or puncture the bottle LGO. 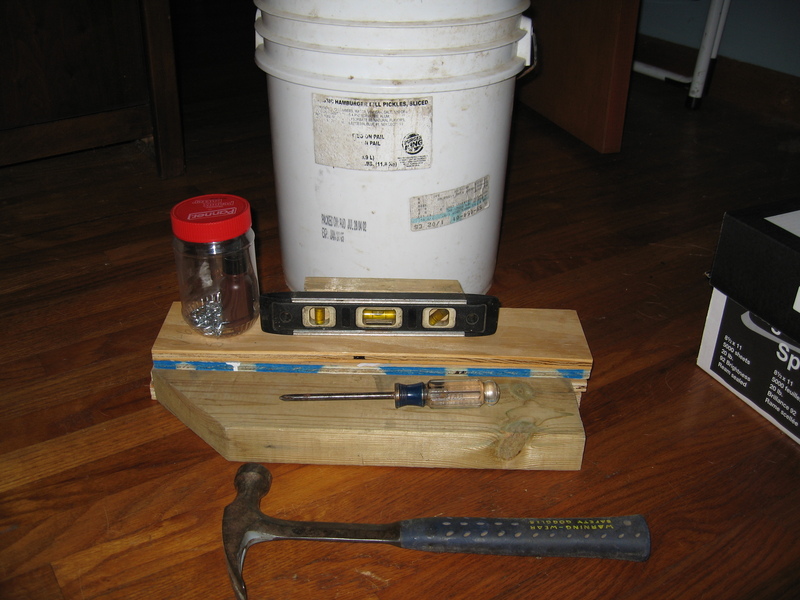 Before you head out put all of the small items listed in the materials list in the five gallon bucket. This will keep everything together and makes for easier transport to the tree. Get your bucket and trap to the general location where you want to locate the trap. 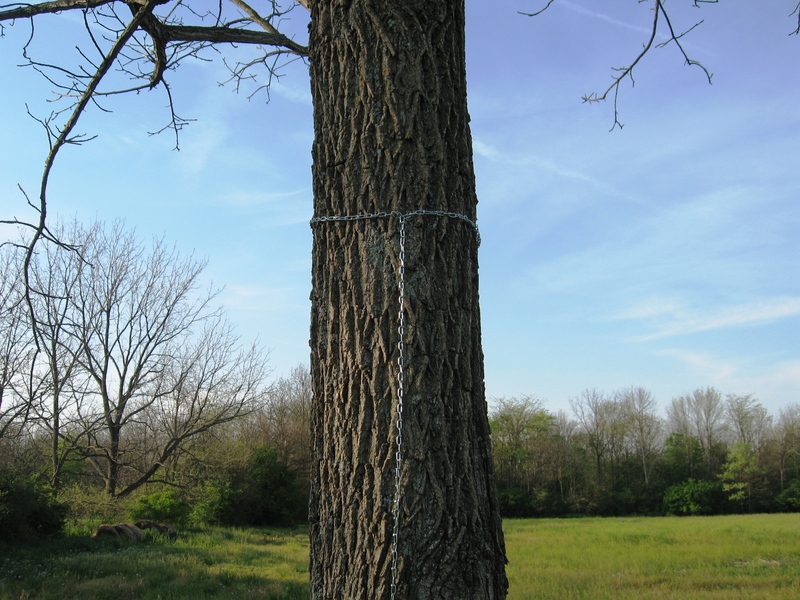 Pick a tree that is large enough to be sturdy, and has bark rough enough to not allow the chain to slip. This photo was taken in the morning so the shadow is falling towards the West. I like a certain type of tree. First of all look for a tree that will provide morning and evening sun exposure while shading the box during the middle of the day. This is most easily done if you can find a tree that is standing out by itself that has a nice canopy overhead. You want one that is large enough that when the wind blows it will not move, yet small enough that you can get the chain around it and have at least 2-3 feet extra. 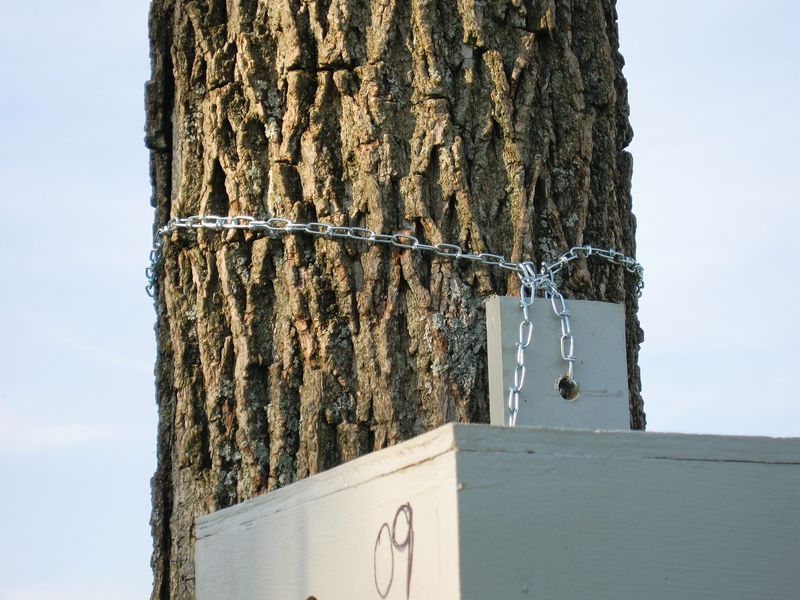 It also needs to have a rough enough surface to NOT allow the chain to slip down the tree once the trap is attached. 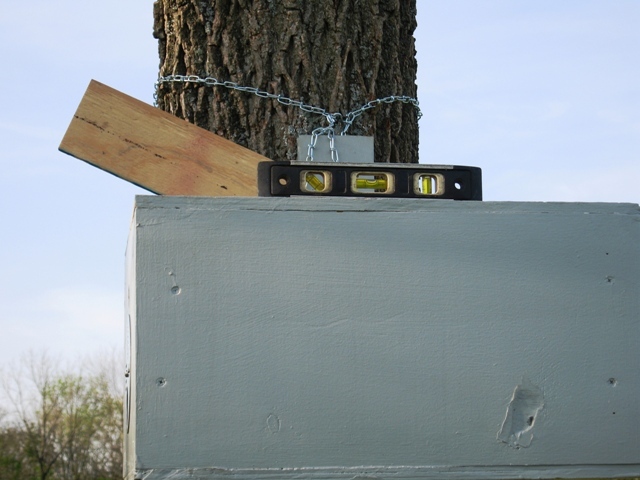 Finally the tree needs to have at least one side that is relatively straight and free of bumps, nubs, limbs, and knots so that you can get good surface contact between the trap and the tree. This will limit movement in strong wind. All of my traps are built the same. For the entrance to face either East or South I hang them on either the North or East side of a tree. Step 3. Wrap the chain around the tree. 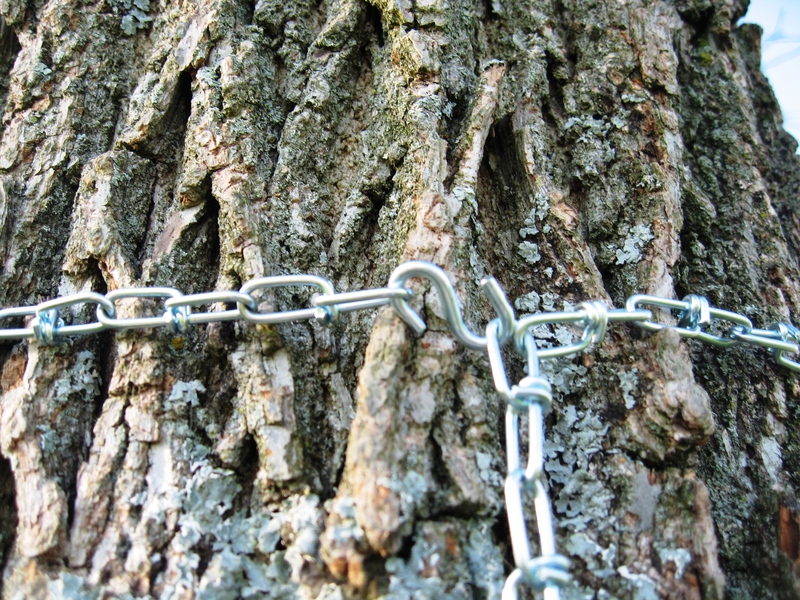 Wrap the chain around the tree up as high as you can reach (without using a ladder). Once you have your tree selected remove all the items from the bucket. Put them all together so you don’t lose anything. Turn the bucket over and place it next to the tree. You are going to stand on it so make sure that it is stable. I get frustrated with this because sometimes it takes a while if the ground is uneven. Standing on the bucket get the chain wrapped around the tree as high as you can. 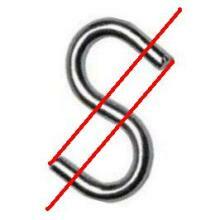 Using an S-hook attach the chain back to itself as in the picture. Note in the picture that there is a tail hanging down the side of the tree. You want that tail to hang down and through the area that your trap will be making contact with the tree. S-hook being used to hook chain back to itself. The chain is passing through the hole then is attached back to itself. Now pick up your trap. 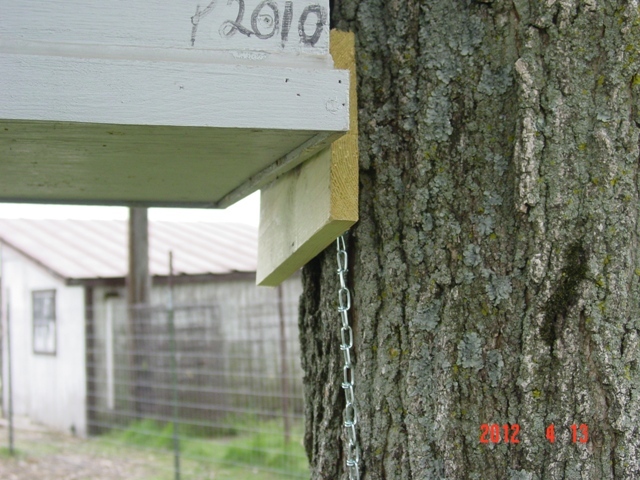 My traps have a 1/2 inch hole in the hanging board and #3 double loop chain will slide right through it. Run the tail through the hole in the hanging board taking up the slack until you get the trap to the desired height. Then use another S-hook to attach the chain back to itself. Level the side that measures 19-7/8 inches first. Next take your ratchet strap and wrap it around the tree and the hanging board. This takes a little finagling. Once you get everything hooked up, begin to tighten the trap to the point that it is just getting snug. Then place your bullet level parallel to the 19-7/8″ side of the trap. The side that runs parallel with the frames. Leveling the 16-1/4″ side oft he trap. The level is perpendicular to the frames. You can see that I had to shim this trap (bottom left of the trap). Once you get done with that side move the level so that it is perpendicular to the frames. This is the most critical part of the entire process since I use foundation-less frames. Sometimes to get this accomplished you will need to shim the box with something either high or low. This is why you brought along the scrap pieces of wood. It sometimes requires a couple of tries to get it just right. That is why it is important to start with a tree that is fairly straight in the first place. Now ratchet that strap tight so that there is no movement. Re-check your level going the other way and you are just about ready to walk away. Make sure that your closure device is NOT loose and that the hole is OPEN. Use your screwdriver to tighten the closure device screw if necessary. Just prior to leaving remove the lid from the bottle of LGO. Place a finger over the opening of the bottle and invert it so that the LGO gets all over your fingertip. Return the lid to the bottle and rub your finger all over the front of the box and inside the entrance hole. Pack up all of your stuff and check back in a week or two. When you return apply a little more LGO to the face of the trap and entry hole. I try to get my traps down by mid-July or whenever I run out of deeps whichever comes first. Check in on them at least every two weeks unless you can count the landowner to keep you up to date on their status. If you leave them up too long they become VERY heavy. If you find out you have a catch wait to move them until the bees are bringing in pollen. As soon as you see this behavior get the trap down and the bees hived. Once you capture a swarm in a trap that thing will be HOT so get the bees out of there, reload it, and get it hung again. If hung in a good spot it will likely be reoccupied quickly. Good Luck get out there and get your traps hung. I’ve been following your blog for awhile now. Back in April I had ordered my first package of bees. I am a complete and total beginner! After a year or so of educating myself I decided to give it a go this year. After all my reading and research I decided to try beekeeping using the Warre hive instead of the more traditional (at least in the US) Langstroth system. We could talk a bit I think about that decision but for know I do have a question-just thought a little background would be good! Well I did get my my package of bees-I ordered “small cell” bees from out of state and after a prolonged trip through the postal system they finally arrived in the mi.ddle of a three day rain storm! I hived them later that day and three days later they were GONE! As a total newbee I was at a total loss as why they swarmed and what I could have done wrong. After a day of abject misery I decided I wasn’t going to let that initial disaster be the end, rather it would be the motivation for my learning to understand and work with the bees on their level – in other words I needed to get my mind out of the “how to” books about beekeeping and into the real world of the bees. Sooooooo . . . I discovered your blog about that time and used your swarm trapping info to build my own-I only had enough of the right ingredients to make one swarm trap for now. I know the odds of catching with just one trap are probably not great, and considering I don’t know any likely spots I figured it was a long shot. Having lost the money I invested (a lot) in 4 pds of bees I didn’t expect to afford another package and so wasn’t hopeful that I’d see bees in my Warre hive this year. A real great friend, also a newbee, found a beekeeper that wanted to encourage my efforts and so sent a deep Lang box with a queen and about 4 frames of brood. Now, how I’m to get those bees to fill that box and then move into my smaller, frame and foundationless Warre boxes is another conversation! Here’s the heart of my message today, I’m looking for some advice on my one, swarm trap. Yesterday I went out to check it, as I have every three days for the last 5 weeks, and I observed bees at the entrance! I watched for about 15 minutes and there were 5-6 bees that seemed to be checking the box out. The same bees never left in all that time, they were inspecting the entrance and then they’d disappear into the box for a few minutes, then they’d be back at the entrance. The bees seemed so intent on their inspections I half expected to look closer and see little tool belts and measuring tapes, maybe little cell phones as they called in the measurements and layout!! What do I do now? Do you think many bees check out the swarm traps and that doesn’t necessarily mean they’re buying? Sort of like selling a condo? You get lots of traffic but no purchase offers? If the bees appear to “move in” how long do I wait before bringing them home? I’m soooo excited and real glad I made the effort to put out the swarm trap. I have a picture of my swarm trap, as well as my progress with the Lang to Warre transfer experiment- can I send pics to you? or if you wanted you could check out my facebook – I’ve been posting my progress with pics. It’s cool how many people are interested. What your first bees did is called absconding. From what I have read package bees do that from time to time especially when they are put in new wooden-ware. I have read several reports of people trying to get top bar hives going and having it happen. From my understanding bees are apt to do it if they don’t like their new home OR in the event they don’t have any brood to defend/care for. I would theorize it might be a way for them to naturally deal with brood diseases in established hives (things aren’t working out here so let’s find a new place to set up shop), but who knows. I don’t think you had Africanized bees, but they are known to do it virtually at the drop of a hat. I think it is one of their ways of dealing with Small Hive Beetles. As far as the bees inspecting that trap they are most likely scouts. They may come and check your trap out for days to even weeks prior to a swarm leaving the mother colony. What you do now is wait. They will be out checking several different locations. Your trap is a candidate among several. You are right… They are checking out their potential new real estate acquisition. 🙂 I recently had a hive take up residence in a tree THAT ONE OF MY TRAPS WAS HANING IN!!! I need to create a page in the “How to…” header section of the site that explains how to deal with this situation. The quick and dirty here can be found in the post The difference between a Hit and a Catch The difference between a Hit and a Catch. Also another helpful post for you would be New Observation on Swarming BehaviorNew observation on swarming behavior. One thing you DO NOT want to do is get overly excited and move the trap too early. Those posts will tell you how to determine the right time. If you still have questions feel free to ask. Sam at Bee Crazy is the only person I know using Warre – type equipment. He is doing well with his bees. I think he would be a very helpful person for you to contact. From my correspondence with him I think he builds almost everything he uses. I think he knows quite a bit about bees too. Send me a friend request on facebook (Jason Bruns – my picture has me standing next to a hive) or e-mail me with your first and last name and I will do it. I would love to see the pictures of your swarm trap. In fact with your permission I may add your picture to a gallery of Swarm Traps made by others. I think I answered all of the questions, but if I didn’t let me know. Congrats on getting into beekeeping and getting into swarm trapping. Feel free to ask me about any questions you have. I want everyone to have a couple of hives around, and swarm traps too! By this point you are well seasoned. Regarding top bar hives, I often think people give them too much space to begin with. I rub the inside of the hive with beeswax and put a drop of lemongrass oil. I also only give them 7 bars to start, no more than 8 with a 3 lb pkg. and place a follower board next and then put the rest of top bars in. I have lost hives to varroa, but never had any abscond. Knock on wood…. I have not messed around with traditional TBH’s. I have been using 10 frame langs until last summer. I introduced 8 frame langs to the operation last year and really like the way that the bees are performing in them. You can use deck screws. I chose not to because some of those boxes of bees weight 40 pounds or more. In my old “shoddy half rotten” boxes sooner or later deck screws will fail. I have just put out there how I do it. There are plenty of people on You-Tube who use screws for the same application. I may over-engineer my traps a little, but I would don’t want trap failure to be an issue. I got the tinkering bug from my Dad. I was always taught to over-engineer unless cost is just prohibitive. A full trap is worth $150 to me…. If the trap falls off the tree it won’t be worth anything. Some nuts, bolts and washers aren’t gonna break my budget so that’s the way I go. There are many beekeepers out there who will say that their method is the “only way to go”… I’m not one of them. Go with what works for ya, until it doesn’t. That’s my motto. 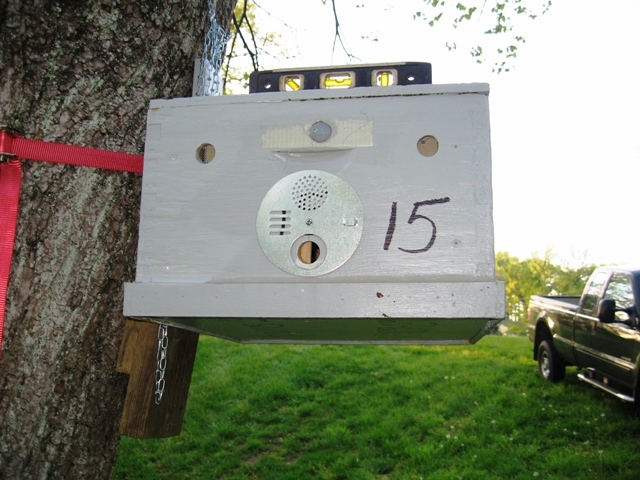 I put out my first bee swarm trap this year i turned an extra super into a swarm trap.I put it into an apple tree on my property that is in full bloom and loaded with bees. Is this a bad thing? Im not sure, I plan on putting out two more traps just not sure where the best place is to put one. In a tree line or next to alot of bee food any help would be awesome. Your spot is probably a fine location. Where I live there is a lot of mono-crop agriculture. Therefore I have wooded rough ground surrounded by open expanses. 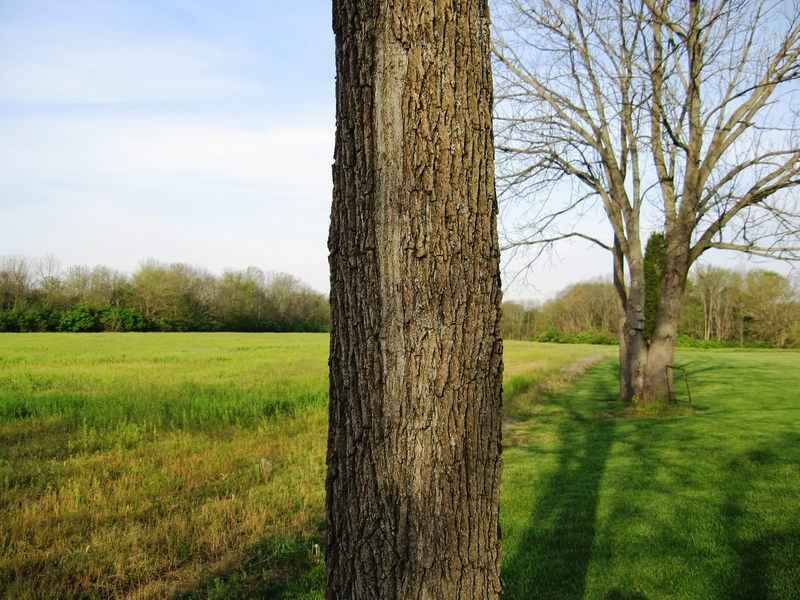 What I look for is a large tree or clump of trees that are out in the open with fields all around. For some reason those conditions tend to produce for me better than any other. BUT REMEMBER THAT IS HERE. I live in Eastern Central Indiana. Where you live things could be a little different. My wife gets tired of me repeating this all the time, but swarm trapping is just like fishing. The pattern may be different from region to region, but the one consistency is that THERE WILL BE A PATTERN. My first year trapping was a total gamble. There was 1 book out about it, and it was from some guy out of Texas. I built 15 traps and just started bumbling around. Another consistency… If you can put it in a tree that will provide shade during the middle of the day with some sun exposure in the morning and evening, success rates increase in my location. The big thing to think about is…… Is there habitat (cavities) within 2 miles of where you are trapping that good feral bees can live? In my case I look for the only places where there are trees large enough to have such cavities inside. Here it is along rivers, and in the scant patches of woods that remain. One thing I will caution you about. Using typical dimension supers as traps may be OK, but could sour you on trapping. Scout bees, using mathematical calculations I cannot even begin to understand pick their locations based on inside volume. According to every source I have ever read they look for something around 35 liters which is only slightly larger than a Lang Deep. Using a honey super may give you success in catching small swarms, but you may miss out on the vast majority of good productive large swarms. I wouldn’t want your attempts to fail and have you think that swarm trapping is NOT a legitimate method for sorting bees. Hi I plan on putting some traps out for the first time this weekend. I read that u take them down by mid july is there a specific reason for that? I live in northwest Indiana about 45 min southwest of Notre dame. I take the traps down because swarms caught after August 1 have a harder time gathering enough nectar & pollen to overwinter here. I live futher south than you. You can keep them up as long as you want and just hope they make it. I have had small swarms come into my bee yard and hit vacant equipment in October before. It was only the size of a softball and I just LetMBee. They died out early that Winter. I just picked up another swarm yesterday in a trap. It was the 3rd one at that location this summer. I’m getting ready to go check them right now. There is a higher mortality rate for swarms caught in July, but the ones that do overwinter usually have a newly mated (this year) queen in there and build up super quick the following Spring. Good luck… and don’t give up if you don’t catch any this year. You will have your traps for next year… Get them up the 2nd week of April…. 🙂 It gives you a better window. ok thanks for your reply!! I have another question I thought about like they probably wont make it through the winter if caught late. Is it bad for me to think well at the very least I will have more drawn comb for next year? Its only my 2nd year all 4 of my nucs died the first year this year bought 6 packages and if they die this winter my plan for next year I think will be maybe just catching swarms. If you are hard up for drawn comb I guess it would be ok. I don’t know how much comb an August or later swarm will produce, but it sounds like we are going to find out. 🙂 I view deadouts as sources for essential beekeeping things that you cannot purchase. If you are going to do this watch for them to die out and then pick the hive up and get the combs cleaned and stored. When bees die in/on their combs over winter and are left ALL WINTER they decompose every time it gets above freezing postmortem . Your late swarm will likely die earlier in the winter than any more established hive. Otherwise you will be dealing with stinking, oozing nasty combs. I learned this the hard way. I am pretty OCD about getting the dead bees out of there. The sooner you remove them after they die out the easier it is. I do most of the removal by bouncing the frames on the sides of the the hive deeps. I will try to remember to get video of this next Spring. I highly recommend catching swarms because eventually a colony of your bees will die. If you make 5-10 swarm traps and place them in various locations you will likely find bees. Once you do so you never have to purchase them again. The bees that I catch here and hive up just live…… I have hives in several yards that haven’t been checked since I supered them in April. I usually check them once a month but have been busy this summer. I do need to make the rounds, but I’m not worried about them. Removing the worry from beekeeping makes it A LOT more fun. Keep me posted on how they do if you catch any. Good luck! I mean… not 100% of the time will they always live… but if you capture a large enough sample size… there will be survivors. Over time your apiary will increase. If there are ferals surviving near you… they will survive in your hiveware . What do you think about using a bunch of those waxed cardboard nuc boxes as bait hives? They’re pretty cheap if you order a bunch of them and easy to assemble. Are they the right size though? Size is the issue there. I’m not saying you won’t catch bees using nuc boxes like that, but you will be selecting for smaller swarms in them. It’s been my experience thus far that generally the bigger the swarm the better it’s chance of survival. It was a lot of work when I made my first couple runs of swarm traps, but after they are made they won’t need maintenance for several years. My goal is to add 15 more by Spring and yeah… I know it’s gonna be 20 hours of work or so when you figure in painting an everything. I wouldn’t recommend it if it wasn’t worth it. Where you located Bruce? Thanks for the super clear description of hanging a swarm trap. Thanks for reading… and commenting. I really like your method for hanging traps . Here is a video of the process. I was by myself and it didn’t turn out perfectly. Hopefully it helps. Good luck. I used chain today to hang. It Went really well. I had trouble with the tie down, but it went easier regardless! Thanks for your instruction. What is your work flow to transfer the swarm from the swarm box to a stationary hive? I have done some videos bit haven’t been happy enough with them to publicly post them on youtube. Here is a link… it was the second one of the year and I wasn’t in the groove yet. The only thing I do differently than in this video is… NORMALLY after removing the first frame I transfer the frames TWO AT A TIME in order to speed up the process. Instead of a nail or chain I use a screw-in step that I use to go up and down trees in which I have deer stands. Since these steps are sturdy enough to support a person if screwed in properly, they can handle a trap even if you catch a large swarm or it gets heavy before you get around to moving it. If I am hanging a trap on lands other than my own I make sure the owner knows this and approves.